On Tuesday, a Texas man was sentenced to three days in jail for scraping his initials into an entry arch at Yellowstone National Park. While people usually carve designs or initials into memorable or pretty spots, on June 10, Dakota D. Tipton used a small multi-tool knife to carve a rudimentary version of his initials into an entryway into one of America's most iconic national parks. According to a release from the National Park Service, 26-year-old Tipton left his mark on a small keystone above a walkway at the Roosevelt Arch Yellowstone entrance. For his actions, which Tipton subsequently called "a bad decision," a U.S. Magistrate Judge decided he should pay $250 for repairs on top of the short stint in jail. Yellowstone National Park Deputy Superintendent Steve Iobst said the "unfortunate act" should be a reminder that "the cultural treasures of Yellowstone National Park require our care and protection to ensure that generations to come will enjoy their presence on the landscape." 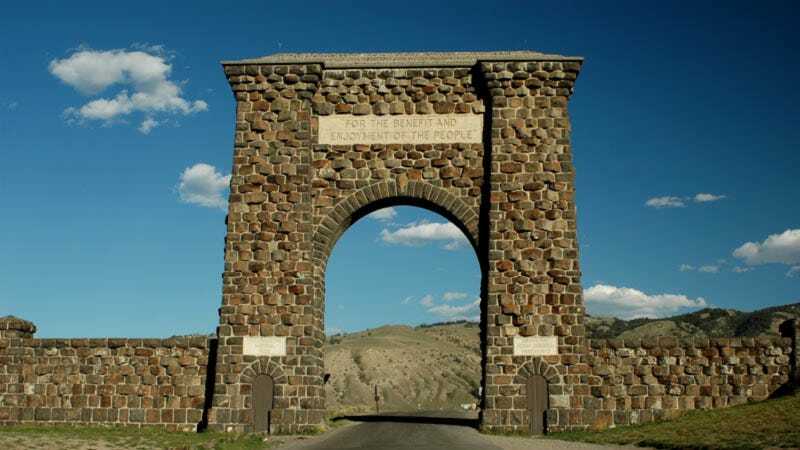 The Arch, which lies at the north entrance of Yellowstone National Park, was dedicated by President Theodore Roosevelt himself in 1903. Detail of vandalism inside Roosevelt Arch. Graffiti and vandalism on public lands are a major issue across the country. This ranges from the type of spur-of-the-moment tagging done by Tipton to stealing valuable Native American artifacts to keep or sell online. This year is the centennial celebration of the National Park Service, and their is an especially harsh lens focused on anyone who chooses to disrespect these areas of great cultural and natural value. Earlier this summer, a graffiti artist was banned from all national parks for defacing areas in Death Valley, Zion, Yosemite, Rocky Mountain, Colorado, Canyonlands and Crater Lake National Parks. The culprit, Casey Nocket—who went by the artistic pseudonym “creepytings”—and her acrylic and sharpie doodles were identified by social media users who noticed her bragging about the indiscretions. An example of Casey Nocket's graffiti in Oregon's Crater Lake National Park.